To improve the appearance of drab, dull upholstery, no company is more effective for restoring vibrancy to old upholstery than KIWI commercial upholstery cleaners. Houston-based and with almost 30 years of experience, Kiwi’s cleaning technicians specialize in both wet and dry furniture cleaning methods. 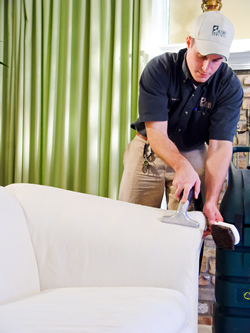 They have the expertise to know which is best for your particular commercial upholstery cleaning job. We can work with a wide variety of fabrics, such as leather, suede, faux leather, cotton, linen and much more. Whether your business’s furniture upholstery is dirty or just old and dull, we can give it a fresh and clean appearance that will brighten the entire room it’s in. At KIWI, we use only environmentally friendly cleaning solutions. Not only is this good news for the earth. It’s also great for those who use your furniture every day. Instead of harsh chemicals that can irritate people with allergies and sensitivities, our gentle yet effective cleaners have a pleasant citrus scent that won’t knock out your employees, customers and guests. Businesses that use Kiwi’s expert commercial upholstery cleaning services include hotels, office buildings, day care centers and churches. After our friendly KIWI professionals have performed an initial cleaning of your upholstery, you can have it treated with protectant that will keep your company’s furniture looking like it has just been cleaned. KIWI is the natural choice of Houston businesses for the best commercial furniture cleaning. We’re fully licensed and insured for your protection, and we stand by our cleaning services with our complete customer satisfaction guarantee. Call KIWI at 713-595-0441 today for additional information about our commercial cleaning services and to schedule an appointment. Your tired old furniture will thank you!